Ten record-breaking animal bones are introduced through a series of superlatives set up as a guessing game with clues. Readers examine animals' skeletons and guess to whom they belong; the answers are revealed in vibrant, full-color scenic habitats, with easily understood — and humorous — explanations. 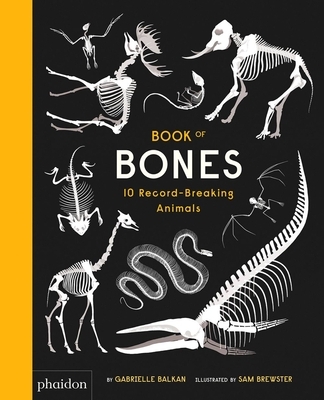 This entertaining introduction to the connection between animal bones (anatomy) and behavior is playful, relatable, and includes touch-and-feel finishes that bring the bones to life! Gabrielle Balkan is a writer and editor living in Brooklyn, New York. Her books include the acclaimed atlas, The 50 States, a NCSS notable book, and its follow-up, 50 Cities. Gabrielle is a former book buyer, commissioning editor, and director of communications. Her work has been published by Harper Collins, Scholastic, and the Whitney Museum of Art. Sam Brewster is an award-winning freelance illustrator, photographer, and filmmaker based in London. He has a roster of prestigious clients around the world, including The New York Times, Guardian, and Creative Review. This is his first children's book.